Before I launch into this, I’ll insert a word for one of the best presentations I’ve ever seen on how the world’s going, and the impact we’ve had on it. Less than a week before his death in May 2001, Douglas Adams gave a brilliant talk at the University of California titled “Parrots, the Universe and Everything “. He conveys many of his experiences and insights on extinction, mostly derived from his time producing the BBC’s Last Chance to See radio series  in 1989. Adams’ 2001 talk is helpfully preserved online by Ted (link above) and I highly recommend it. He’s an excellent and humorous speaker yet his points are serious and well made. If you’ve limited time, jump to 26 minutes for his amusing experiences with the Kakapo, which he declares as a favourite of all the animals he saw. 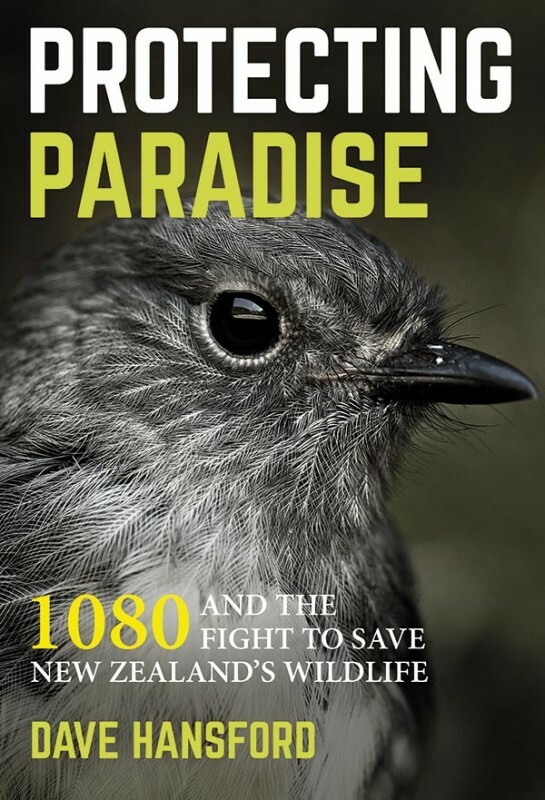 The full title of the book is Protecting Paradise: 1080 And The Fight To Save New Zealand’s Wildlife. It’s authored by Dave Hansford, published by Potton & Burton , and was released in October 2016. The publisher’s website seems to claim 250 pages, but the main text of the printed edition actually finishes on page 265. This is followed by 2 pages of acknowledgments, 6 pages of appendix, 31 pages of references and a 14 page index. That’s around 318 pages total. The 265 pages of regular text is divided into 22 chapters, averaging around 11 to 12 pages each. The book retails for $34.95, but it’s often possible to get discounts if you shop around, or check if the local library has it. 265 pages might sound daunting at first, but it well written. Chapters are well structured without being too long. Editing is of high quality. It’s easy to read. It’s not necessary to have a scientific background. If this review isn’t enough, you’ll find an alternative review at SciBlogs , plus the author’s been interviewed by Jamie Morton of the NZ Herald  and by Wallace Chapman on RadioNZ . Protecting Paradise has been touted as a book about use of the 1080 toxin in New Zealand. 1080 is primarily used by the Department of Conservation for controlling rats, possums and stoats on the conservation estate, and by OSPRI (formerly the Animal Health Board) for controlling bovine tuberculosis, which largely spreads through possums. Right from the front cover it’s clearly framed as a 1080 book, yet it’d be a disservice to the author’s efforts to suggest it’s only about 1080, because the book is not a just raw explanation of 1080 and what it does. Rather, Dave Hansford has produced a comprehensive guide to the history, present and future of pest impact and pest control in New Zealand, including its social impacts. It’s mildly ironic that a large component of conservation in New Zealand is about killing things. Explaining 1080’s role and workings in pest control is well covered, but it’s appropriate that the Protecting Paradise narrative goes well beyond this. The author’s spent large parts of the book examining what is increasingly becoming a social and ethical issue in New Zealand. Alongside the objective analysis, he’s spoken to a wide range of people to draw a picture of how pests, pest control and 1080 affects them, and what it means to them. Lane read my mind, fixed me with a level stare: ‘Would you drink that water, knowing it had 1080 in it?’ I said that I wouldn’t, and I meant it. I don’t share his blanket antagonism to 1080, but most of us might empathise with his experience. We all carry the caution gene. What’s more, we like to think that we carry a sense of natural justice: there’s something understandably disturbing about a Government dropping poison from the air—against the express wishes of some—around our homes and across our treasured spaces. That’s powerful, almost Orwellian, imagery, and it’s a potent anathema. As a nation, we’re not just trying to figure out how to protect native and endemic species. We’re also struggling with the question of how much that should happen. We’re trying to figure out how much it costs, and not just in monetary terms, and what’s ethically acceptable. For some people, the question is even about whether wide scale pest control should be attempted at all. Research and implementation of pest control in New Zealand is ongoing, to the extent that New Zealand-based entities are world leaders in some respects, but obtaining the social licence from the populace to apply wide-scale pest control in New Zealand is another aspect entirely. Working with society, sometimes enduring and coping with conflict, has becoming an increasing component of conservation in New Zealand. Beyond the raw measurable metrics, outcomes of pest control are tangled with industries, recreational pursuits, and strong cultural identities. All of these affect the discussion of what New Zealand could, and should, be attempting to achieve. Somehow, people have to talk to each other and understand each other’s perspectives, as well as understanding the facts behind what’s actually happening. This certainly doesn’t mean that opinion or belief trumps objective fact, or that the author doesn’t express opinions. In fact, one of the author’s first points is that there’s a clear distinction between objective scientific opposition and subjective ethical opposition. Besides this, however, there’s an awful lot of mis-information out there on the objective scientific side, and so an awful lot to investigate. It follows that the book focuses on provide as much well-researched fact as possible in the objective domain so that readers can be well informed, whilst attempting to show and respect the ethical opposition from some quarters for what it is. If you’re influenced by external factors whilst reading Protecting Paradise then your resulting opinion might vary from other readers, but you’ll most likely come out at least well informed of the science and rationale behind New Zealand’s pest control methods. Most modern conflict around New Zealand pest control occurs around use of the 1080 toxin, and in particular its aerial application over large areas to control rats, possums and mustelids. This practice is claimed by its proponents as the last realistic hope for saving what remains of New Zealand’s native flora and fauna, yet it’s also the focal point of angst, anger, confusion and any number of assertions of risk. It may also be that the notoriety of 1080 has made it a proxy issue for opponents of New Zealand’s pest control programmes, or even the government, generally. 1080 use in New Zealand, whether in social media or mainstream media, has thus become a polarised information war in the teacup of New Zealand society. It’s a highly emotive argument, and not something to envy. With pest control mostly happening on the conservation estate, however, and away from where most will see it, it’s an argument in which probably only a small part of the population are deeply invested… at least until a person encounters and finds reason to wonder about it. Everyone wants to woo McLean’s 80 per cent—that undecided middle. […] all covet that fertile constituency because, they perceive, those hearts and minds are the ones that will carry the day. But how best to capture them? What language, what imagery, might coax them off the fence? Whenever I mentioned to people that I was researching a book about 1080, their first question was usually: ‘Will it be pro or anti?’ Before any conversation could take place, they needed to know which tribe I belonged to. For anyone in the 80 per-cent with a circumstantial reason to question pest control practices, and 1080 in particular, there’s a high chance of encountering the polarised few scrapping for attention, or scrapping to debunk those after their attention. Lies and misinformation and exaggeration, not to mention a separate tier of misinformed people, are all over the place. For someone new to the conversation, it’s not the easiest thing to make sense of without some effort, which is part of the problem. Protecting Paradise stands out by the lengths it goes to to speak to experts, to speak to real people (though there was a campaign in some circles encouraging people to refuse to speak to the author), and to clearly present what is said. The author reaches clear views about 1080, but this opinion is derived from the facts he’s presented, backed up by 31 pages of references. It goes further than merely citing the sources, though. It questions, then describes, how those studies and researchers reached their conclusions. Elsewhere I’ve seen people criticise the book for citing Facebook comments. Those criticisms are baseless. The author only ever quotes comments from social media in informal ways, usually for the purpose of giving loose examples of the types of conversations and statements taking place, usually before considering those statements in more detail. If you’ve heard anything about 1080 toxin and want an assessment that goes deeper than a random claim from the internet, it’ll most likely be discussed in this book. I find the 1080 argument frustrating to follow because there’s such a hopeless signal to noise ratio. So much of this argument is about people trying to make stuff true by saying it, and expecting to be believed for no other reason than the forcefulness with which the statement was made. I enjoyed Protecting Paradise, though, because it doesn’t do that. It’s easy to read, yet whenever a significant statement was made, it was backed up with clear reasoning and citations which I could check out in case of any doubt. That gave me some confidence to actually take it seriously. That said, there was never a doubt that Protecting Paradise would evoke anger upon its publication. It was always a given because the discussion is already so polarised and full of hate. Consequently, broadcasts are already out telling people not to bother reading it, and what to think of it in advance. I won’t tell people what to think about 1080, but I do think that everyone with an interest should use their own judgement of this book by actually reading it themselves, instead of taking the word of people who say it shouldn’t be read. Reach your own conclusions from your judgement of the tone of the book about whether it’s informing you or misleading you. If all else fails, maybe go back to Douglas Adams’ parrot talk again. It’s funny. 1 Comment To "Protecting Paradise, by Dave Hansford (my thoughts)"